Safely add up to 8 electrical devices without terminal stack-up at the battery post. Termin-8's simple, patented design installs fast and easy into tight places without buying extra parts or special tools. Simply unplug the fuse to add or remove devices. Heavy duty wire capable of 30 amps max. 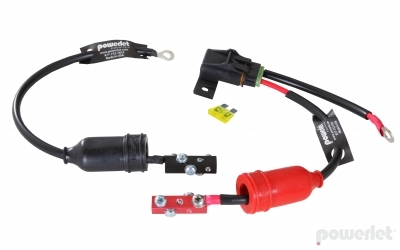 Designed to last the lifetime of your vehicle this low cost fuse block provides a convenient means for powering GPS units, radar detectors and more. This unit can also receive power from a battery charger to maintain the vehicles battery. This low cost solution is less expensive and simpler to install than most fuse blocks including those made by Blue Sea Systems, Centech and others. Installs using ty-wraps; no need for special mounting brackets, special tools or special skills. Everything is included, you do not need extra wire or terminals. Smaller than a conventional fuseblock, Termin-8 fits in tight places. Powerlet® simplifies the purchase and implementation of todays technologically advanced electronics by offering the most complete, expertly engineered, interconnects and appliances. This enables our customers to enjoy a lifestyle utilizing convenient modern electronics. Powerlet seeks the highest quality materials and craftsmanship. Termin-8 kits are assembled and tested in the USA by people who like to ride. Quality components and attention to detail ensure Powerlet products resist wear and corrosion to last a lifetime.